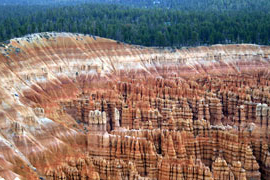 Located near the Dixie National Forest, Bryce Canyon National Park is a showcase of towers and spires carved out of pink cliffs. Limestone formations created by the erosion from snow, ice and rainstorms over millions of years, the natural creations are awe inspiring. Home to the Clarks's Nutcracker and the Blue Columbine, mother nature is alive in red, pink and orange at sunrise.